Dan O'Hagan reports from Little Gransden. Additional photography Dan Butcher. It must be one of scenarios that gives organisers sleepless nights. A rain cancellation. Twelve months of hard work washed, sopping and glugging, down the drain. 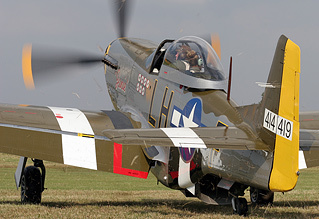 You'd have been a brave man to swap places with Little Gransden organiser Dave Poile MBE in the hours leading up to his 2013 show, for this was a close-run thing: "This year was probably the worst starting position we have had as far as ground conditions were concerned. The airfield itself is always in good condition and drains well, meaning that we can assemble the various parts of the show without major problems. The issue was, and always is, the public parking areas - no parking, no show!" Just how close to the brink this year's show came will certainly surprise many of the record 5,500 spectators who went: "On the Saturday evening we decided that we probably should cancel, as the predicted dry Saturday afternoon didn't materialise. however by that time we were really committed to putting the show on as not enough time was left to effectively cancel without resorting to turning people away on the gate, something we really dreaded doing! "We spent the evening redesigning the parking to make best use of the dry areas and thus allow the predicted dry Sunday morning to dry the wetter fields before we needed them. This turned out to be the perfect plan as the strong sun from mid morning onwards dried the farmers fields before we used them". Though far from being a large airfield and showground, Little Gransden certainly packs in the ground attractions. Before flying started, walking around the 350 classic cars was a real joy. Some terrific types and marques on show, with everything from a Lagonda to a Lotus - and plenty in between. It was excellent to see that the local Scout troop were providing the barbecue, rather than the "horse burger" concessions that service, and rip-off, spectators at most other shows. As far as the "static" display went, this consisted mainly of the display aircraft with one or two notable exceptions. Most impressive among these was an Agusta A109 helicopter of the Belgian Air Component. Attracting this kind of military participation would be considered a coup for an airshow twice the size of this one, so Dave and his team deserve huge praise for thinking big. If one doesn't ask, one doesn't get. Don't forget this show managed to attract a Canadian CP-140 Aurora in 2011! The flying display was, frankly, everything one could reasonably expect to ask for, from a show of this size. At such an intimate venue, smaller acts which would otherwise be lost at the large military shows can really show off their full potential. Solo aerobatics, perhaps appropriate at an airfield synonymous with that type of aircraft, were a dominatnt motif of Little Gransden 2013. At his "home" airshow, Mark Jefferies Extra 300 kicked off the display with as jaw-dropping a display of "solo aeros" as you are likely to see. New to the circuit this year, and aged just 26, UKAR favourite Lauren Richardson put in a fine performance in her Pitts Special, as her reputation as a display pilot continues to grow, while a more established performer Nigel Willson, is his Yak-52, flew a routine that is always pleasing on the eye. The prize for innovation though surely went to Chris Burkett flying his Extra 300 in synchonised "formation" with a 1/4 scale radio-controlled replica. A terrific display, and one which captured the attention of the whole crowd. Pleasing too was the appearance of Avro Vulcan XH558. No display has been more criticised than the Vulcan's in 2013, but here at a small venue, the Mighty Delta cut an imposing figure as she ran in for a mini-display of three passes. The first pass, largely straight and level, led into an impressive power climb right in front of the crowd. This is what we've been wanting for years. We understand the need to limit engine cycles, but when '558 does pour on the coals, just make it within the crowd's earshot. Martin Withers then repositioned for, arguably, the pass of the season, bending an impressive topside around the dog-leg of the crowdline, basking in excellent light. 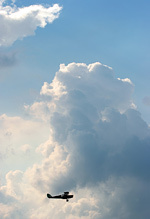 One pass like that does more to impress than twenty tame, distant displays. The Vulcan is about her size, noise and presence. Bring her in close to the punters, let them see and hear her, and VTTS will find their displays an awful lot more popular. 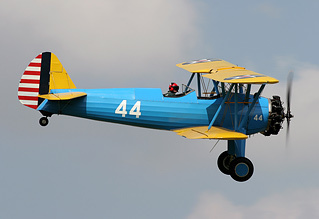 Cliff Spink's performance in the Boeing Stearman was an elegant display of Golden Apple's splendid example, showcasing its lines and rasping sound, while making excellent use of the whole display line. His vast experience of airshow flying was obvious. Other American types on show included a pair of Harvards, and a most interesting pairs display by the home-based Spartan Executives - the only two of their kind in Europe, as well as a quite stunning privately-owned Waco biplane, which was only a late weather replacement after the Great War Display Team cancelled due to weather. Captain Neville's Flying Circus are Little Gransden regulars, and vastly underrated on the airshow circuit. Flour bombing, limbo flying and balloon bursting are guaranteed crowd-pleasers, especially in such delightful vintage machines such as the de Havilland Queen Bee and Thruxton Jackaroo. Other teams on display included the ubiquitous SWIP duo, as well as the TRIG pair in their yellow and purple Pitts Specials. A smartly-liveried Pilatus PC-12 was a very rare aircraft to see displayed, and the Shuttleworth Collection's Avro Anson is always a welcome sight, especially playing "away from home". This was an airshow where the less-celebrated acts shone, while the "stars" actually disappointed. Nowhere was this more evident than with the "grand finale" - back-to-back displays by Peter Teichman in Hurricane IIb "Pegs", and the Rolls-Royce operated Spitfire PR.XIX. Never before have I seen such a disappointing display by the normally-excellent Teichman. 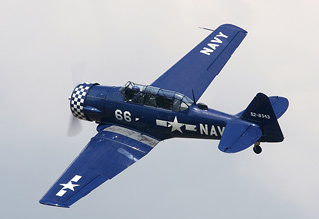 High and distant, and without use of the dog-leg line, which he exploits so masterfully at Old Warden's airshows. The Spitfire which closed the show, however, made the Hurribomber display look positively close. It barely got below 500ft, and probably never got much within a mile of the crowdline. It was quite telling that not once during these two closing displays did I press the shutter button. This was true, earlier in the day, of the Battle of Britain Memorial Flight's fighters. At venues like Little Gransden, when so many aircraft display close to the crowd, the BBMF, hamstrung by frankly ridiculous over-zealous military regulations, really are left exposed, as it becomes obvious just how much further away they display compared to the civilian items. Again, they too failed to use the curved crowdline, meaning for a succession of sweet-sounding, but high and dull underside passes. 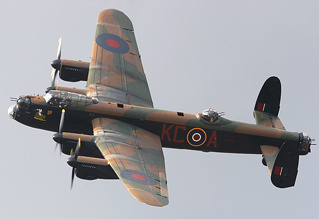 In fairness, the Lancaster did at least finish with a topside pass, of sorts. 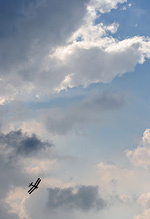 It is a fact that if you want good quality photographs of the BBMF's display, you need to be outside the airfield. If there was a wooden spoon, then I'm afraid it has to go to another RAF act - the Tucano solo. Once again, military display regulations meant Flt Lt Andrew Fyvie-Rae's display was totally lost. Looking around the crowdline during the Tucano routine, literally no-one was watching. One wonders what the purpose of these trainer routines is, if not to engage the crowd? As a recruiting tool, I doubt any child present went home thinking they'd like to follow a career in the Royal Air Force based on that. No matter how good the pilot, the Tucano is, to the masses, just a light aircraft with roundels and surely one which needs to be flown close to the audience to make any kind of mark, even at a show as small as this one. Arguably the star item on the ground was Maurice Hammond's quite fabulous P-51D Mustang "Janie" - flown by, and it appears operated by for the summer, Maurice's long-time friend Rob Davies. With P-47G "Snafu" being packed off to the States, there's a very good case for this Mustang being the finest-looking civilian-operated warbird in the country. The sound of her Packard Merlin was something to behold, and though Rob's actual display wasn't especially impressive, "Janie" has a real presence. 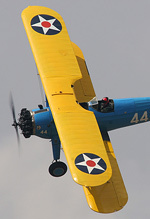 We just wish more shows would book the Hardwick aircraft, as they are sadly quite seldom seen. We heard several people ask if this was a "new" P-51 in the country, as they'd never seen it before. The Mustang's display appeared to be truncated by the weather-delayed arrival of Clive Denney in The 108 Flying Group's Nord 1002 Pingouin, masquerading as a Messerschmitt Bf108. The two aircraft then engaged in a rather unconvincing, and one-sided, dogfight, with the Mustang bimbling around at half-power, with her flaps down. Personally, I think I'd rather have seen full-blooded solo displays from both types, rather than an unbelievable set-piece. 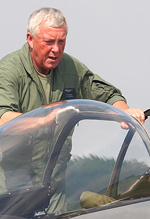 Commentary on the show came from Little Gransden regular, and former Flypast magazine editor Ken Ellis. A major criticism must be that not once did he "trail" what was coming up, nor did he inform the crowd of any cancellations. Of course this may have been to sell more programmes, but with the weather causing some significant re-shuffling, a commentator's job has to include keeping the audience informed of any changes. Among the non-flying subjects discussed was the Children In Need auction, the "top" lot being certainly a contender for the most bizarre sentence ever spoken over an airshow public address system - "fifteen square metres of floor sanding". We're unable to report how much that went for, but clearly our bid was gazumped. Unique, in the UK at least, is the short memorial service conducted mid-way through the display. At a larger, less intimate venue this would appear twee, and would get lost among the vast expanses of concrete, but not at Little Gransden. Here it really works, and is genuinely poignant. Barring the odd errant child the entire crowd fell silent to reflect, and if you were so inclined, pray for airmen past and indeed present. The sight of veterans bearing squadron standards should always be cherished and respected. The UKAR contingent had a fine old day at this show, but of course there are areas to be improved. Chief among these has to be to get more pilots to use the dog-leg of the display line. It's no surprise that the aircraft that impressed most - the Vulcan, Stearman, Waco, Harvards and Spartans, all exploited the curve, while the most disappointing acts didn't. Also the "official photographers" airside need to be made more aware of the paying public behind them. One such photographer, who seemed incapable of moving away from the P-51, will have ruined the take-off and landing shots of tens, if not hundreds of other spectators. While this one is clearly a little larger than some, the Eastern Counties have some terrific little, "local" shows. Old Buckenham, Seething, and the late, lamented events at Rougham, all of which, like Little Gransden are rare gems on the display calendar, the type of airshows that remind you why you began going to watch them in the first place. Seldom-seen aircraft, flown close to the crowd, with a genuinely warm atmosphere, with none of the vulgar corporate peripherals which have come to infect some of our larger shows. With a real spirit of Keep Calm And Carry On, 2013's show beat the weather, thousands came, and went home richly entertained, and hopefully Pudsey Bear will be getting a rather large cheque in the post too. Despite a possible record "take" on the gate in excess of £53,000, Dave tells us that rising costs mean they probably won't beat their record donation of £33,000 "but it will be close!". This was a show where everyone was a winner.